The back rower picked up a back injury against Glasgow last weekend. 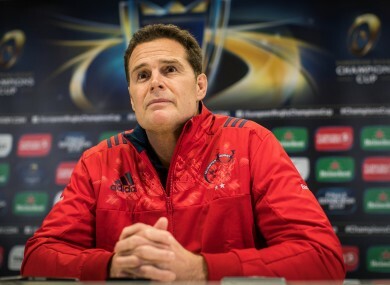 Munster director of rugby Rassie Erasmus. RASSIE ERASMUS IS confident captain Peter O’Mahony can shake off a back injury in time to lead his side against Leicester Tigers in the Champions Cup this Saturday. O’Mahony complained of a stiff back following his withdrawal after 57 minutes of his side’s Pro12 win against Glasgow last weekend, but his coach is hopeful that the Ireland back rower can feature in the Thomond Park clash. South African centre Jaco Taute (ribs) and Duncan Williams (shoulder) picked up knocks in that win at Scotstoun, but Erasmus is confident he’ll have all three available. “Injuries, since Saturday, just Peter. Peter O’Mahony has a little bit of a stiff back,” said Erasmus. There was good news however, as Erasmus confirmed that Tyler Bleyendaal’s ankle issue has improved after he sat out last weekend, while the arrival of Francis Saili on the training pitch for the first time this season is a timely boost. Taute has been a vital cog in the Munster midfield since Saili’s injury, but with him set to depart the province on 31 December, Saili’s return is welcomed. “We want to keep him (Taute) but he was only a replacement for Francis and is definitely going on. “Francis will train on the field for the first time and he will hopefully be available for the week of the Leinster game [on St Stephen's Day] if everything goes according to plan, either the A side, a club game or in the 23. Donnacha Ryan returned as a replacement last weekend, but Keith Earls, Simon Zebo, CJ Stander and Conor Murray are expected to slot straight into the team for the arrival of Tigers. But the English Premiership outfit will also be boosted by having their internationals back after a busy November. “I’m not sure how much better we’ll need to be but our intensity will definitely need to be different. “I think the moment you run out for a game like this the intensity just ups because you’re playing against internationals, whereas sometimes in the Pro12 there’s fewer international players and there are some weaknesses. “When you get into Europe there are very few weaknesses in the opposition so I guess the intensity levels are up and the room for mistakes will be much less. “So our intensity levels will be the thing to take another step up this weekend,” said Erasmus. Email “Munster boss confident skipper O'Mahony will be fit to take on Leicester”. Feedback on “Munster boss confident skipper O'Mahony will be fit to take on Leicester”.